Five minutes into the first period, Braden Holtby stymied Anthony Cirelli on a breakaway, keeping the Lightning off scoreboard. The Caps responded when Lars Eller beat Andrei Vasilevskiy glove side off an Alex Killorn turnover at the blue line for his 12th goal of the season. It’s the first time Eller has opened the scoring for the Capitals this season. The lead did not hold. Tom Wilson took a holding penalty at the end of the first period, and on the ensuing power play in the second period, Nikita Kucherov ripped a wrist shot past Holtby for his 36th goal of the season. Steven Stamkos capitalized on another power play after Alex Ovechkin was sent to the box for elbowing Ryan McDonagh. Stamkos’ goal is his franchise-leading 385th. Cirelli got revenge after his failed breakaway attempt, and threw the puck to the front of the net where it deflected off John Carlson’s skate. The Caps clawed back on another Tampa Bay turnover, and Eller sent a pass to Carl Hagelin to beat Vasilevskiy back door. The goal was Hagelin’s third with the Caps since he was traded from the Los Angeles Kings at the trade deadline. T.J. Oshie tied the game at three off an Ovechkin slap-pass rebound. The goal marked Oshie’s 200th point with the Capitals. The tie was short lived, as Kucherov pulled the Lightning ahead again on the power play. Soon after Michal Kempny left the ice after an awkward hit with a lower-body injury and did not return. 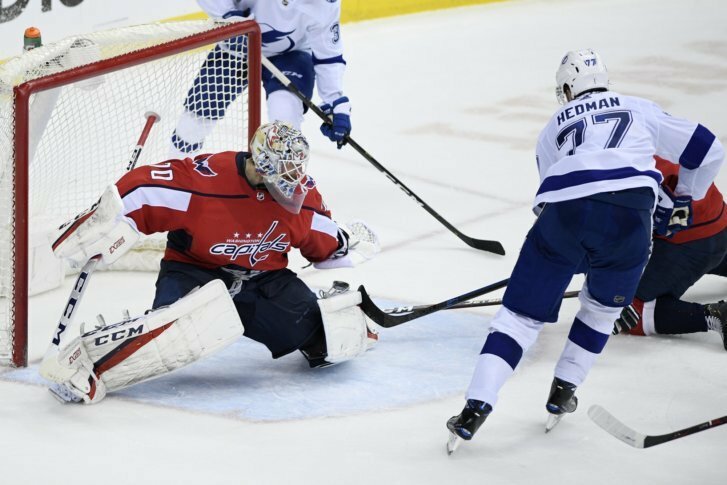 The Caps tied the game with under a minute remaining when Evgeny Kuznetsov slung a shot from a desperate angle through Vasilevskiy, but Victor Hedman sealed the win for the Lightning in overtime with a deke to the backhand. Mailbag: Will Caps call up Riley Barber?